A criminal mastermind creates violent tableaus in abandoned Detroit warehouses in Lauren Beukes's genre-bending novel of suspense. Is [the serial killer] insane or legitimately possessed? Beukes doesn’t answer this question fully until the well-executed final chapters of her thriller, but the journey there is exquisitely paced and impeccably controlled … The domestic emotional struggles of the crusading cop and her precocious daughter are as engrossing as the hunt for the killer. Beukes also commits to the other members of her ensemble cast with brisk, suspenseful chapters that crackle with authentic shifts in narrative voice … an enormously satisfying novel that employs the best attributes of multiple genres to dramatize big ideas about art, the Internet and urban decay. As a horror and suspense novel, Broken Monsters is flawless — I haven't read a scarier, more tense book in years. But Beukes brings so much more to the table: There's a huge amount of bitter social satire here … Broken Monsters is very much a novel of the present. The city of Detroit is a major, tragic character in the novel — ‘Some people have ghost towns, we have a whole ghost city,’ as one local artist puts it … It's hard to overstate how ambitious Broken Monsters is, maybe because Beukes somehow manages to make it look easy. Her prose is unhindered, exuberant and something like addictive. 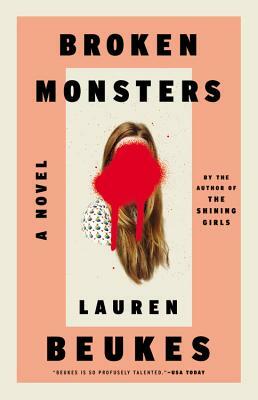 Lauren Beukes' captivating Broken Monsters defies the standard tropes of the serial killer genre to become a thoroughly modern, supernatural thriller set against the backdrop of a crumbling American city (Detroit) attempting to piece itself back together … The book's main characters are connected by nightmarish hallucinations, and while Beukes' supernatural touch is a refreshing addition to the crime fiction genre, the source of these phantasms is somewhat opaque and mildly frustrating, though beautifully drawn and full of doom … There is a tense push-pull between the inhabitants of Detroit and their gentrifying occupiers about who is allowed to create the narrative of city and who is the most reliable narrator of perceptions of the place. What did you think of Broken Monsters?